There's no doubt that chocolate is a favorite dessert flavor, and these Ghirardelli 25 lb. 100% cacao unsweetened chocolate liquor wafers can intensify the bold chocolate flavors on your dessert menu! Thanks to their petite, round wafer shape, they're much easier to melt and use than block chocolate. While these pure chocolate liquor wafers are too bitter and intense to be enjoyed on their own, they're perfect for increasing the cacao content in your decadent desserts. 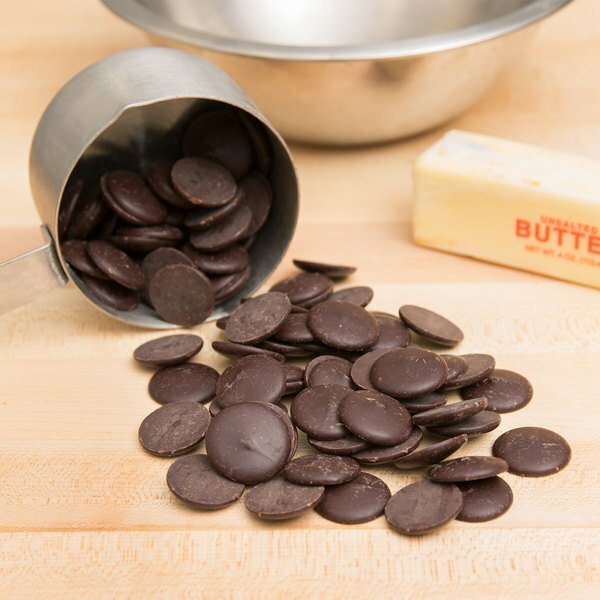 Use them for baking rich chocolate cakes or to make a smooth chocolate glaze or ganache. They're also great for coating your customers' favorite snack foods, like pretzels, nuts, truffles, bonbons, and fruits. Plus, the bulk 25 lb. supply is perfect for your high volume business. Customers will recognize and trust the Ghirardelli name when they see it in your cafe, coffee shop, ice cream parlor, or restaurant. Ghirardelli began with a young Italian chocolatier in the early 1800s and is now a brand widely known for its rich flavors. This sense of quality is the result of Ghirardelli's commitment to control all steps of the chocolate-making process, from roasting the cocoa beans, to refining the product for smoothness and well-balanced flavor. In addition, the company understands that sustainable sourcing and knowing the origins of the cocoa beans speaks to the quality of the finished product. No matter what dish or drink you prepare, guests are in for a treat with these 100% cacao unsweetened chocolate liquor wafers! My husband maintains a low carb diet and has been desperate to try his hand at low carb chocolate desserts. This is the most reasonably priced package of unsweetened chocolate wafers. Additionally, it's the smallest unit you can buy at once. I love these wafers for adding rich, dark chocolate flavor to icings or homemade chocolates. They're very strong on their own, but if you love dark chocolate like I do, they're great mixed with the Ghirardelli dark chocolate wafers also sold on this site. They did not have any issue melting even being shipped in the middle of the summer. I will definitely buy these again! Great quality chocolate, it’s rich, dark and delicious - even without sugar. I admit sneaking a couple in my mouth while baking. Very good quality for great price. 100% cacao is so bitter yet really good for you. I love how you can add as much sugar or as little, but overall makes any chocolate cakes, pancakes, and a great addition to warm milk. This really is a cheap price considering you are getting a great name brand product. We go through these really quickly in our large scale bakeries. Nice product! We use this chocolate in our brownies. Chocolate arrived in great condition, well packaged. We will continue to buy this as stock gets low. My first box arrived damaged. Webstaurant replied right away. When they hear that i needed the chocolate for the next weekend they two day shipped the replacement to me. Love this chocolate. Melts perfectly for my brownies. These Ghiradelli 100% Cacao Unsweetened Chocolate Liquor Wafers are wonderful and at a great price here on Webstaurant.com We have used them in many recipes, both as a small component (think baked goods) and as a main ingredient (think bark). They are easy to work with and have great flavor. These unsweetened chocolate liquor wafers, are my secret ingredient, for my Signature chocolate coatings. Wonderful taste, they melt very smoothly and easily, on the stove or microwave. Maintains hard shell coating, after chocolate has cooled.